A simply beautiful way to tweet. All ad slots are currently filled. Email webmaster@iconfactory.com to be notified when new slots open up. Twitterrific is the award-winning, elegant Twitter client for Mac and iOS that’s easy to understand and a delight to use. We've got a tech-savvy, engaged bunch of users on our platform who are open to relevant, well-designed advertising. We have a paper that provides detailed ad metrics and information. What you get: We guarantee 1,000 tap-throughs to your App Store page or web site for $150 a month. Ad design: It's on us! Easy pay: Subscribe monthly via PayPal and cancel at any time. Reporting: Impressions and tap-throughs for every ad. Also integrated with App Analytics (for iOS) or Google Analytics (for websites). Each ad runs for a month, and we're happy to replace it with a new one after that. Art Send a source file (AI or PSD) or high resolution graphic for your logo. URL The URL where want tap-throughs to go. Include a utm_source if you want to track with Google Analytics. App ID The ID number used to display your App Store product page. If you have different ones for iPhone and iPad, include them both. Provider ID Your provider ID/token used with App Analytics. We generate the campaign link automatically. Launch Date If you have a specific launch date, let us know. Otherwise we run the ad after it's approved. You may cancel the subscription at any time via PayPal under Payment Settings, in which case your ad will run through the end of the current month and not renew for the next month. Note: All ad slots are currently filled. Email webmaster@iconfactory.com to be notified when new slots open up. An ad subscription is $150 US per month per ad. It will run monthly until you cancel your subscription via PayPal’s Payment Settings. No refunds for the month in which your ad is running at time of cancellation. We reserve the right to adjust inventory as necessary, reject ads, or to stop running ads on Twitterrific in which case we will inform you in advance and provide instructions on cancelling your subscription. Follow @Twitterrific for the latest updates. 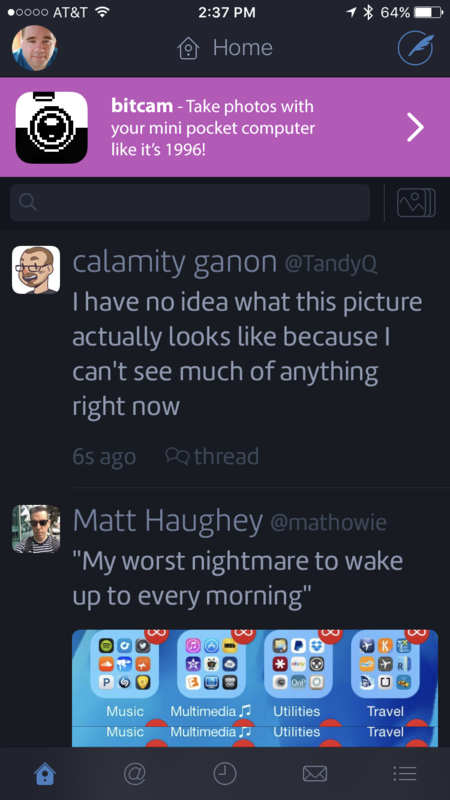 Looking for the Mac version of Twitterrific?